Takebashi Barracks (竹橋陣営兵舎) housing the infantry battalion of the Imperial Guard (近衛歩兵大隊) in Tokyo, in front of the Imperial Palace. 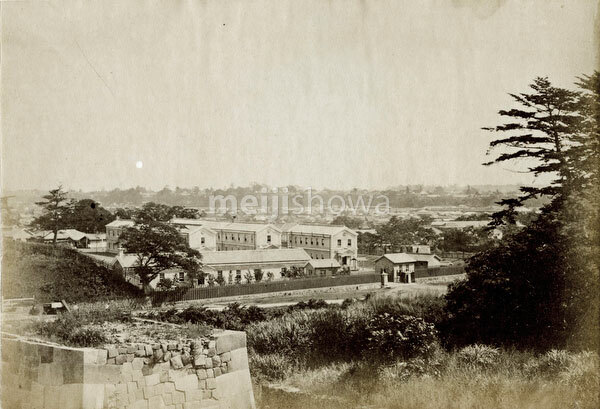 The barracks were designed in 1872 (Meiji 5) by the British architect and engineer Thomas J. Waters (1843-1892). On August 23, 1878 (Meiji 11), 260 Imperial Guard members based here mutinied. The government managed to put down the mutiny and moved the Imperial Guards to a new location in what is now Minato-ku, farther removed from the Imperial Palace. Published in The Far East Vol 6, No 12 of June 30, 1875.